MAD Architects presented the Cloud Corridor, a future housing research and design of Los Angeles. Image: courtesy of MAD Architects. 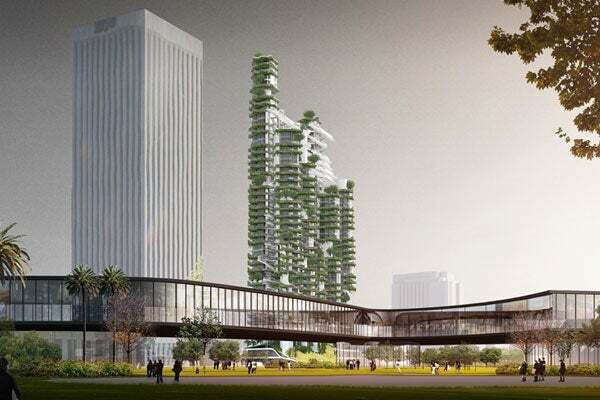 The Cloud Corridor features nine towers with floating garden patios, connective landings and bridges atop a rising podium. Image: courtesy of MAD Architects. The podium is designed as a sculpted structure that is lined with a grass lawn interspersed with trees. Image: courtesy of MAD Architects. Design for the Cloud Corridor encompasses an area of 9,032m² and includes a 167m-high vertical village that will integrate various neighbourhoods around the Museum Row. Image: courtesy of MAD Architects. The Cloud Corridor concept was presented as part of A+D Museum’s exhibition titled 'Shelter: Rethinking How We Live in Los Angeles'. Image: courtesy of MAD Architects. An exhibition was held in Los Angeles by A+D Museum titled ‘Shelter: Rethinking How We Live in Los Angeles’. At the exhibition, six design practices based in Los Angeles were invited to present their ideas in the form of design proposals for innovative and creative housing in the city. The exhibition included design architects Bureau Spectacular, LA Más, Lorcan O’Herlihy Architects, MAD Architects, PAR, and wHY. Featuring single and multi-family housing proposals, the exhibition aims at creating awareness about changing needs in housing developments. Proposals are for two popular development zones, the Wilshire Corridor, where a new subway extension is planned, and the Los Angeles River, which is home to an extensive restoration project. MAD Architects presented the Cloud Corridor, housing research and design future of Los Angeles. Design of the proposal imitates the architect’s recent concept of a ‘landscape city’ and presents a futuristic urban residential model. "Cloud Corridor highlights a changing city in need of solutions to deal with demands of a rising population and inclusivity." Cloud Corridor highlights a changing city in need of solutions to deal with demands of a rising population and inclusivity. Challenges faced by the city include overpopulation, high costs, congestion and environmental crises that are straining existing residential infrastructure. MAD Architects’ proposal epitomises Ma Yansong’s philosophy about architecture displaying the relationship between people and nature. The design for the Cloud Corridor encompasses an area of 9,032m² and includes a 167m high vertical village that will integrate various neighbourhoods around the Museum Row, a one-stop destination for some of Los Angeles’ best museums. Plans for the proposal involves a design that redistributes density vertically and creates a feeling of community and inclusion. It features nine towers with floating garden patios, connective landings and bridges atop a rising podium. Initiating a dialogue between residents and nature, the proposal’s design offers a contemporary take on housing and aims at placing residential architecture in a culturally rich location that includes the Los Angeles County Museum of Art, the Academy Museum of Motion Pictures, the Petersen Museum and the Purple Line Metro. The vertical village proposed by the architects reorients the streets vertically and connects the nine residential towers via connective corridors that wind through the buildings to create a sense of inclusion among residents, making the towers lively and villages vibrant within the city. Altering the conception that high-rise buildings are a statement of power, the proposal presents buildings that are integrated with nature and highlight the environment. The Broad Museum is a post-war and contemporary art museum being constructed at Grand Avenue in downtown Los Angeles, California, US by philanthropists Eli and Edythe Broad. Featuring vertical gardens, each floorplate is designed with gardens accompanying residential units. Garden patios and courtyards are incorporated to create a lush environment among the surrounding high-density areas. Multi-level garden patios and elevated corridors offer spaces with spectacular views, while adding greenery to the city skyline. The proposal’s podium is planned as a park located near the Museum Row and above a planned Metro station. Serving as both a public park and a transportation hub, the podium will provide a location for activities to museum visitors after hours. The podium is designed as a sculpted structure that is lined with a grass lawn interspersed with trees that gives an impression of rolling hills. The podium design includes a private-access lobby for tower residents and an entry for Metro station travellers. Integration of infrastructure and nature is a running theme in the design of the podium that dissolves boundaries between urban landscape and natural scenery.